For decades, diners at Cafe La Fleur have passed unknowingly by one of Laurel’s hidden treasures. Housed just feet from where they stood on the sidewalk, or behind their backs as they waited for a table, were remnants of times gone by in the City Beautiful. 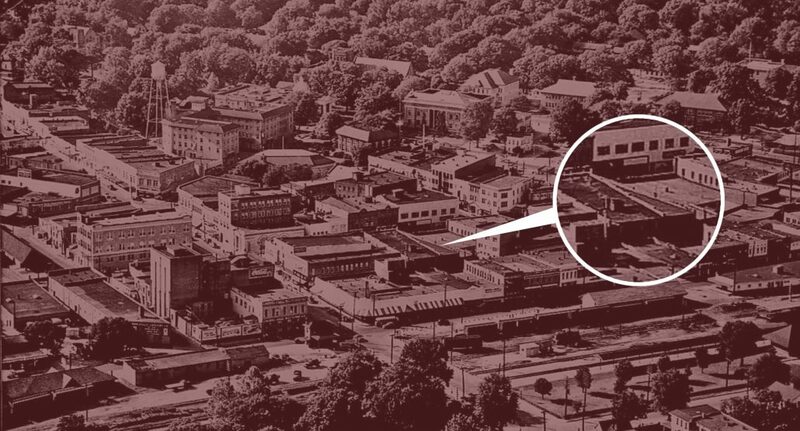 Old furniture, stacks and stacks of lumber housed for generations, pieces and parts of long-obsolete appliances and other household items – all sat quietly collecting dust just beyond the hidden walls between the beloved cafe and Big Chief’s Furniture building. The address of this sleeping giant? 315 1/2 North Magnolia St. 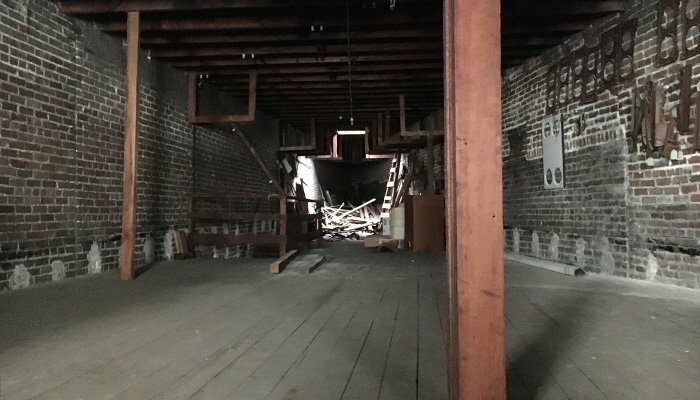 The hidden warehouse features exposed brick walls, original wood floors, countless vintage odds and ends, and wooden stairs built by Mr. Lott himself, leading up to the loft above including a skylight. It even features an interior wall with the recognizable star-shaped anchor plates on the exterior of Café La Fleur. It has no façade or storefront, with only a set of large, wooden double-doors in the alley behind Lott – often photographed by unknowing photographers as they capture the beauty of Downtown’s largest alley. Visitors pass through the creaking wooden doors into a time-capsule of Laurel’s history. 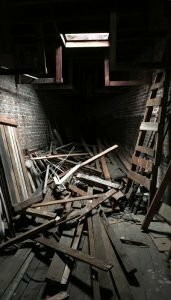 Passed down from word of mouth and fading memories, we’ve gathered up many of the prior uses for the building. We know that Mr. Lott bought The V before the 50s’ for the purpose of storage, lockers for our route-men, and a place to repair furniture. Old-timers tell tales of The V sporting a secret speakeasy during Prohibition, and it being a place where race relations were friendlier after the turn of the century. 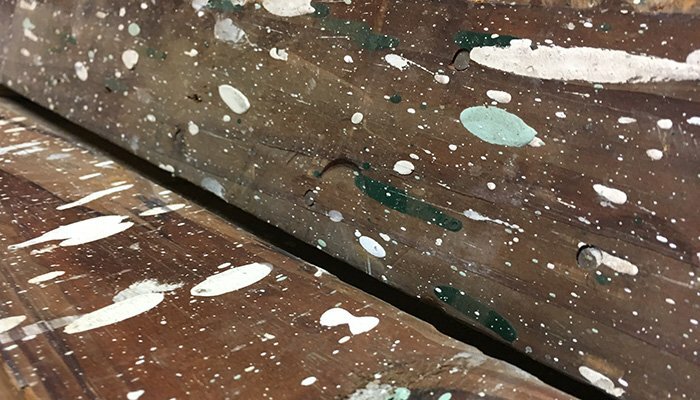 And now, through a very special partnership, you will have the opportunity to own a piece of this incredible, yet largely unknown, part of our town’s beautiful history. A new partnership, and new life for Downtown Laurel’s most unique building. 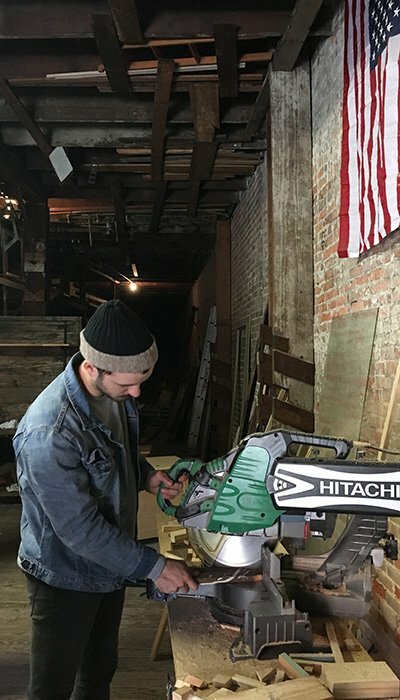 We are collaborating with Chad Evans, local wood-worker and craftsman, to transform The V into his workshop and a place solely for creation and artistry. The integrity of the building has been carefully maintained, only cleaned out to make room for Chad’s tools and supplies. This Saturday, November 26, we have come up with a very special product to share with you all for this year’s Small Business Saturday. 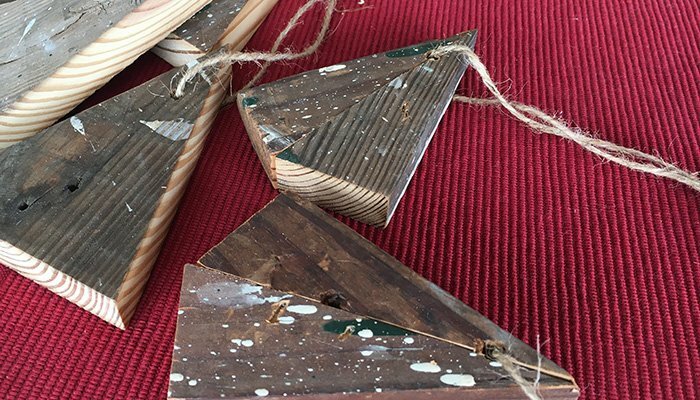 We have asked Chad to gather up some of the 100 year old wood from the rafters of The V and create a limited number of simple, rustic Christmas ornaments. Come see us this Saturday during Small Business Saturday, to purchase one of these rare, one-of-a-kind ornaments so you can have your own piece of Laurel’s story on your tree! Supplies are very limited, so don’t wait! Save me an ornament! I’ll see y’all Saturday! !